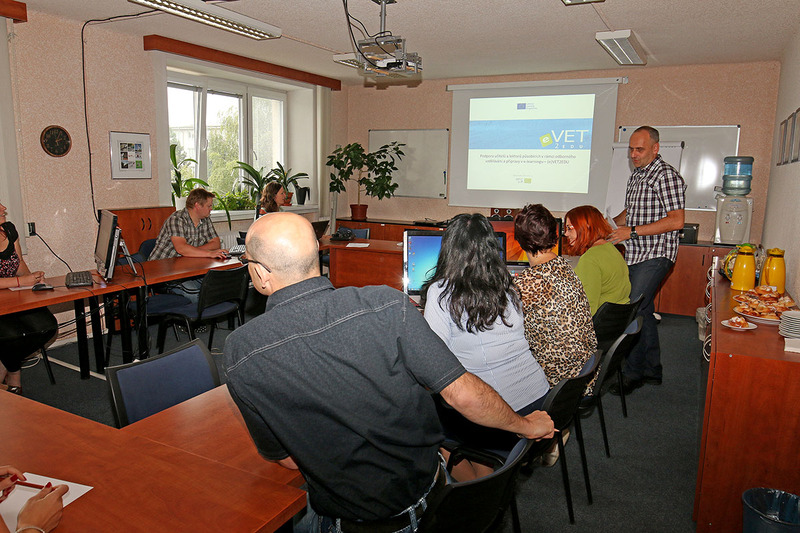 23/09/2014 – (e)Vet2edu Exploitation Workshop “Open resources and on-line tools in education”. Within these three workshops our goal was to invite and discuss topics about on-line education with the various target groups. We wanted to create a picture of how these groups perceive new possibilities offered by the online environment and if they already use or plan to use it in their classwork. It was especially interesting to compare lecturers and trainers active in the practice in enterprises with teachers in schools. Teachers are much more skeptical, conservative, while practitioners are able to apply ideas and are more inclined to modern forms of education. Due to experiences from different backgrounds, it was possible to discuss the benefits and possible problems in different situations. There were also discussed areas in which it would be appropriate to solve teaching on-line. They expressed also that “grasp all, lose all” – mainly children and young people need to maintain a compromise between “virtual” and personal interactions. This entry was posted in Partners' meetings by mareks. Bookmark the permalink.